Rosy Gold Bebe: Clarisonic Love!!! So for Christmas I received a Clarisonic Mia. I may be one of the last people on earth to have one, maybe not. I truly believe EVERYONE on this earth should have one!!!!! This item has performed magic on my skin. I did have a little purging for the first week & a half, but found pure joy knowing my skin was getting a deep cleaning. I use the sensitive skin brush, as this is the most common brush for all skin types. There are various brush heads for different concerns. This is to be used once a day, I use it once a day for 6 days. I like to let my skin relax for a day, without it's use. My pores are shrinking, being cleaned thoroughly, fine lines are even fading. This lightly sloughs off dead skin, impurities, and makeup. I have been using mine with Fresh's Soy face cleanser. I LOVE this cleanser too!!! It smells super fresh & cleans great without leaving my skin tight & dry. This cleanser is great as a little bit goes a long way. Please invest in one or ask for it as a gift, you will be SO glad you did!! My skin feels absolutely AMAZING!!!!! You can get this one below at Sephora for $125.00 I know this can be a lot for some, but I promise it is well worth it. 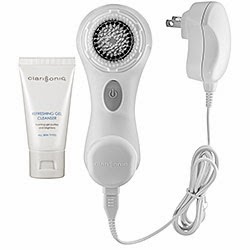 The knock off choices are not nearly as good as this one oscillates getting your skin super clean & improving skin's texture & overall radiance.